Pelling Design were enlisted to create a engagement platform that would on-board more dental professionals for leading whitening brand Philips ZOOM! 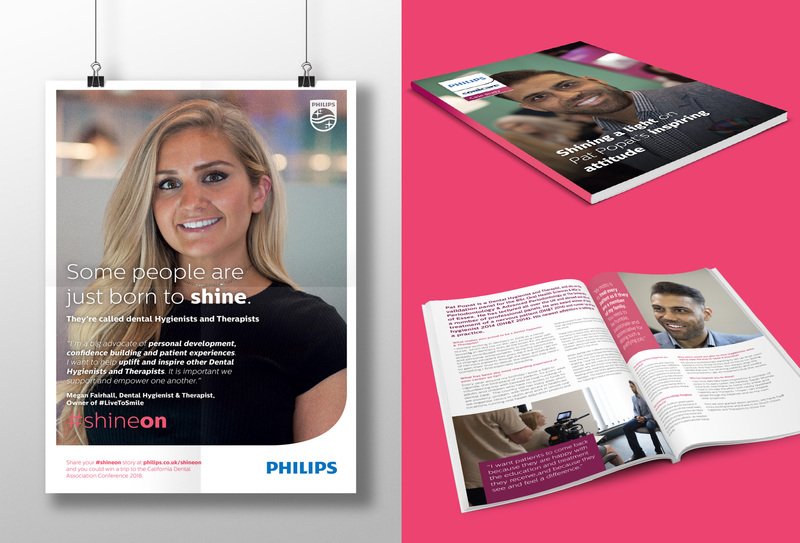 Using the hashtag shineon as a platform handle, we developed a entire series of marcoms, including (and not limited too) adverts, social, brochures, website, landing pages and dental practice collateral. As with any campaign we designed and created a set of design concepts that included all of the touch points mentioned above, and discussed which would work best with the client before moving through to design, website build and production. Having a strong call to action and easy to find and fill out online form was key and in our eyes a simple and obvious way to capture as many leads as possible. The roll out of the campaign was incredibly fast paced and assets were required on a daily basis through the launch of the campaign - a lot of it re-active marketing which was not only a real challenge our design team relished but great fun too!